EnergyTrend indicates that in 2013, global PV market demand increased quarter by quarter and the amount of grid-connected installation reached 31.5GW as expected. The actual demand turned out to be better than expected - 35.8GW rather than the 33GW predicted earlier because orders were placed ahead of time in the Japanese and Chinese market. Among all, demand from EMEA (including Europe, Middle East and Africa), USA, and Asia accounted for 32%, 15%, and 53%, respectively. 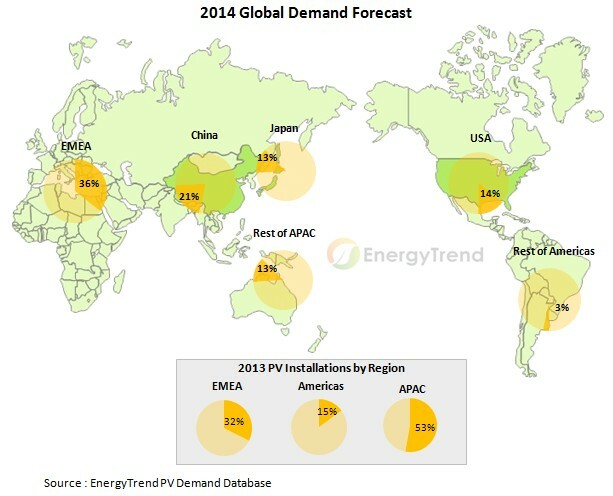 “Market demand is still going to be strong in 2014 and China, Japan, and USA will remain the top 3 PV markets, representing 50% of the global demand. Overall, demand in the second half of 2014 will still be better than the first half of 2014. Market demand in the entire 2014 will be around 42GW, a 17% rise compares to 2013,” said Jason Huang, research manager of EnergyTrend. The market is generally optimistic about the demand in 2014. But since subsidies have been cut significantly, the development for large-scale power plants is to be tested. Whether self-consumption segment can fill the gap in a short period of time has become critical to the continual market growth. EnergyTrend points out that the subsidy reduction in Europe and module tariff restriction in China may cause project return rate to be lower than expected, and thus shrink the market size of large-scale projects. In addition, demand is likely to decline further before self-consumption systems turn into a mature market. As for the Japanese market, the number of orders placed was much higher than the amount of grid-connected installation in 2013. If fewer orders are being placed after 1Q14, demand will substantially decrease. By then, global demand will be about 40GW. In order to reach global demand of 45GW, demand from more than 8 countries has to exceed 1GW and the emerging markets in all regions have to be supported by PV policies. Meanwhile, demand from China will have to be above 9.5GW or even become the first one to exceed 10GW within a year. Overall, If demand in China, Japan, USA, and EMEA reaches 12GW, 6.5 GW, 8.7GW, and 17GW, respectively, global demand of 50GW may be possible to achieve. 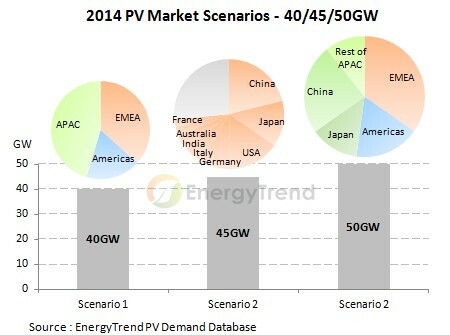 EnergyTrend believes the chance of reaching 50GW will be slim. However, if it does happen, PV industry will go back to the glorious days like previous year. EnergyTrend believes demand will fall between 40GW-45GW. If 42GW is the basis, module capacity growth rate of 18% will be slightly higher than demand growth rate. Comparing companies’ capacity expansion and current demand forecast, EnergyTrend proposes two main points to the supply chain. Industrial concentration: After manufacturers with less competitiveness being eliminated from the market, the sales channels have been mostly controlled by first-tier manufacturers. Shipment for first-tier manufacturers obviously surpassed their nameplate capacity and it’s likely to remain in 2014. Yet, 10%-30% of their shipment will go through second/third-tier manufacturer OEM. While supply from top 15 global module manufacturers will represent more than 65% of the global market, industrial concentration for polysilicon and wafer manufacturers will also become more obvious. If the situation remains, price within the supply chain will mainly be controlled by first-tier manufacturers. However, simply judging from market supply/demand and demand of 42GW estimated by EnergyTrend, supply chain outlook next year seems positive, with total utilization rate surpassing 70%. Once demand reaches 45GW, wafer supply shortage issue will show. Hence, first-tier manufacturers may expand wafer factories and second-tier manufacturers may resume production in 2014. Supply/demand changes within regional markets: On the basis of 42GW, although supply and demand has almost reached equilibrium, regional market changes can be hard to predict. According to the supply and demand analysis, equilibrium has been achieved in the Asia-Pacific markets. However, there will be supply shortage issue in EMEA. As for USA, they may start lower the price to win market share. Among the three markets, Chinese manufacturers will be the only ones that can handle the Chinese markets; Japan’s brand manufacturers still control more than 50% of the market share in Japan; more than 30% of the market share in the US will be controlled by two major manufacturers. Therefore, under the supply and demand condition, it will be difficult for module manufacturers to have higher prices in the emerging markets since demand is usually small and price is usually the focus. “ Manufacturers have mostly turned around losses since 3Q13. Merge and acquisition remained and demand mostly came from Asia-Pacific markets in 2013, which has finally brightened the PV industry. It’s projected that industry adjustment will still be required in 2014 as manufacturers have clearer segmentation. Although market demand may not explode, there’s plenty of room for first-tier manufacturers to improve. Meanwhile, a variety of new PV product applications will appear in the markets,” added Huang.